We often hear a well-known saying this time of year: April showers bring May flowers. Beautiful blossoms of life cannot be produced in May if nature doesn’t work its course to water the plants in April. 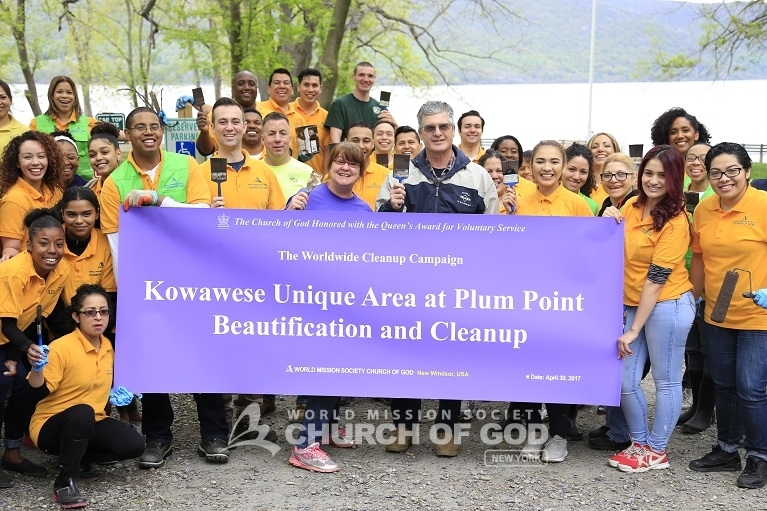 Similarly, Church of God volunteers worked hard to beautify Plum Point Park in New Windsor, just in time for the blooming flowers of May. 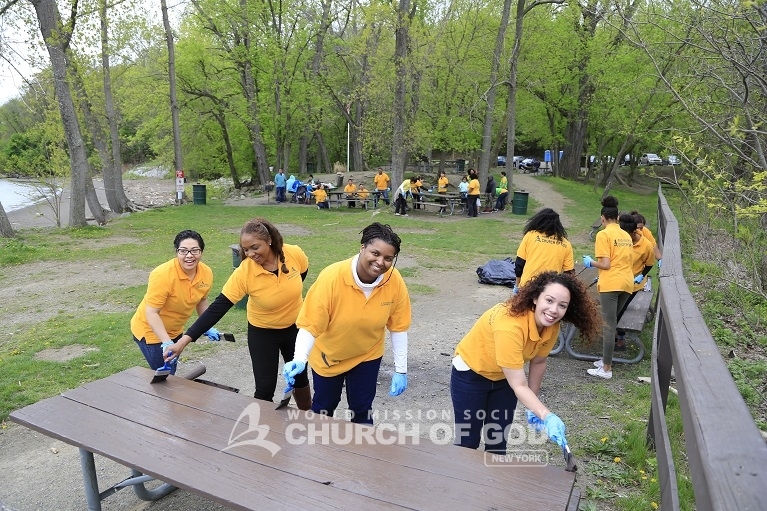 On Sunday, April 30, about 40 volunteers from the Church of God beautified Plum Point Park. Settled right beside the Hudson River, Plum Point Park is a popular outdoor destination for residents in Orange County. The Church of God partnered with the Orange County Department of Parks and Recreation to make this event possible. Moreover, the department supplied the volunteers with everything they needed to get the job done. Armed with paint brushes and sanding paper, volunteers went straight at it to make 16 picnic tables smooth and pristine. The park rangers at Plum Point Park explained that the picnic tables hadn’t even seen a touch up, let alone a refurbishing, in years and that locals would greatly appreciate it. The volunteers also painted a handful of sign posts and benches around the park. 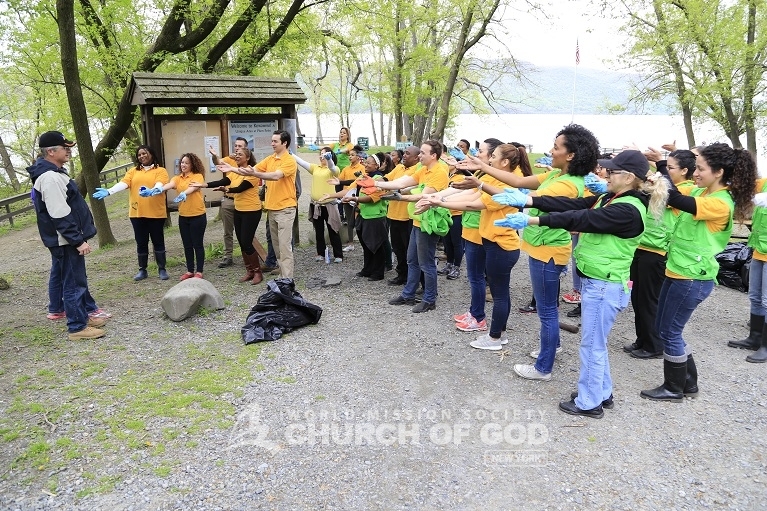 Meanwhile, other members diligently picked up trash and debris from the park grounds and along the Hudson River shoreline. Church volunteers painted 16 picnic tables at Plum Point Park in New Windsor. The Church of God in New Windsor plans to carry out many more volunteer activities such as this in Orange County. The park rangers noted how impressed they were that the volunteers could have such a fun time while doing manual labor. The jovial attitudes of the volunteers comes as a result of following the attitude of Christ, who’s joy is to serve others. With a smile and a loving heart, World Mission Society Church of God volunteers’ earnest wish is to transform their communities into citadels of love, one volunteer service at a time. 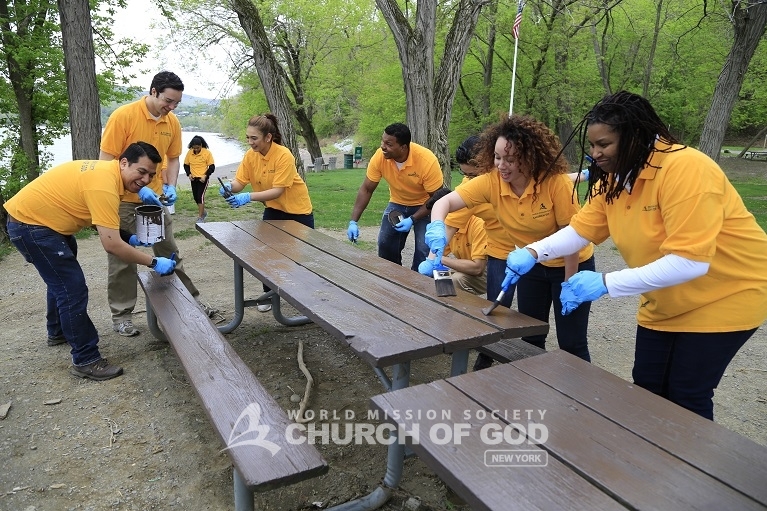 Church of God volunteers painting a Plum Point Park picnic table to a pristine finish. Volunteers from the Church of God in New Windsor joyfully painting a Plum Point Park picnic table. One volunteer had a great time painting a Plum Point Park bench. 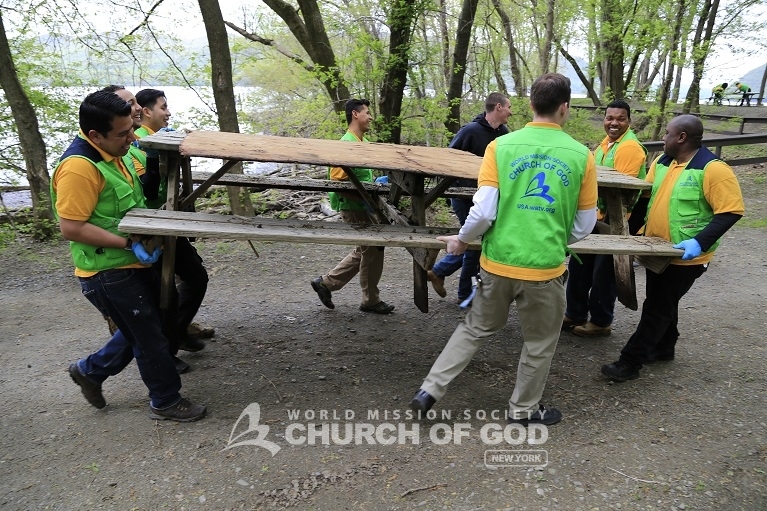 Volunteers moved an old picnic table out of the park during the Plum Point Park beautification and cleanup. 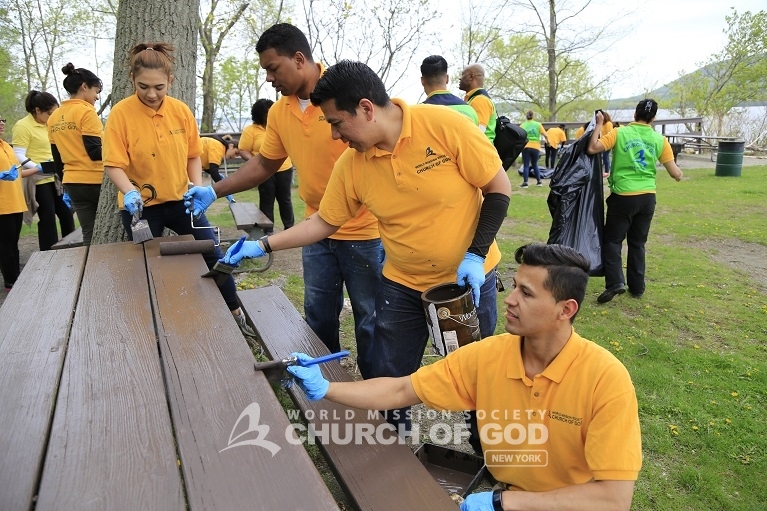 Church volunteers sanded down the picnic tables at Plum Point Park in New Windsor before painting them. Volunteers from the Church of God prepping before painting a Plum Point Park sign post. Volunteers repainted sign posts, making them bright and vibrant at Plum Point Park. 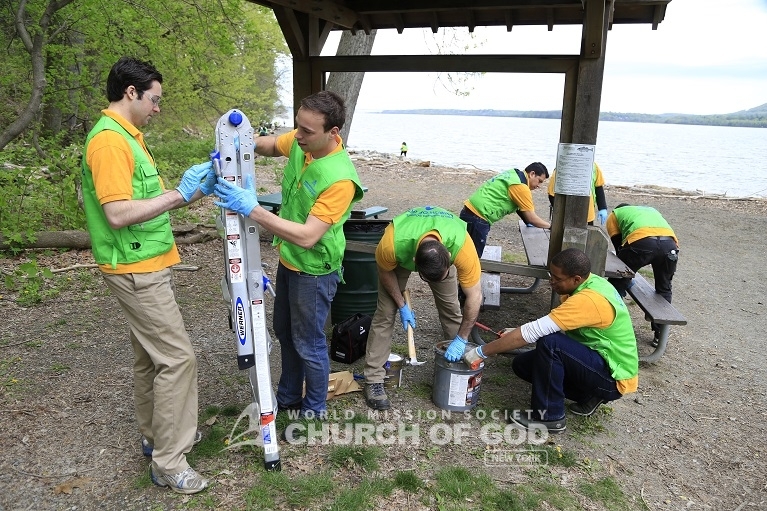 Church members found various types of disregarded trash on the shoreline of the Hudson River. 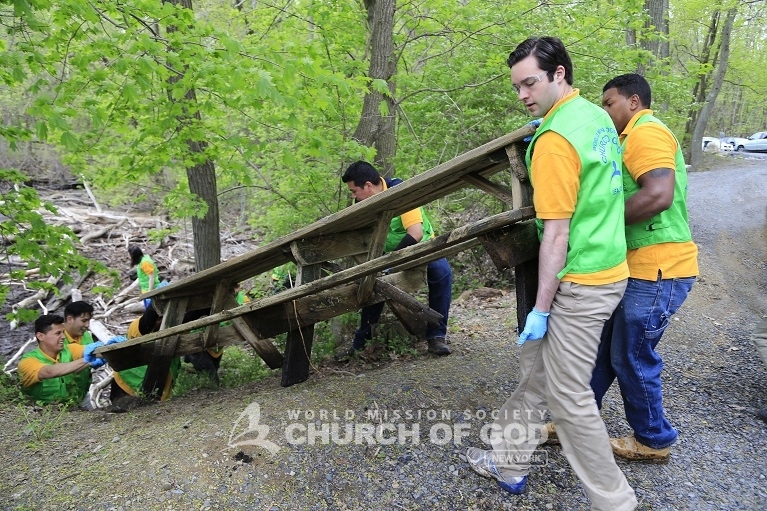 Volunteers removed a bench from out of the Hudson River during the Plum Point Park cleanup. 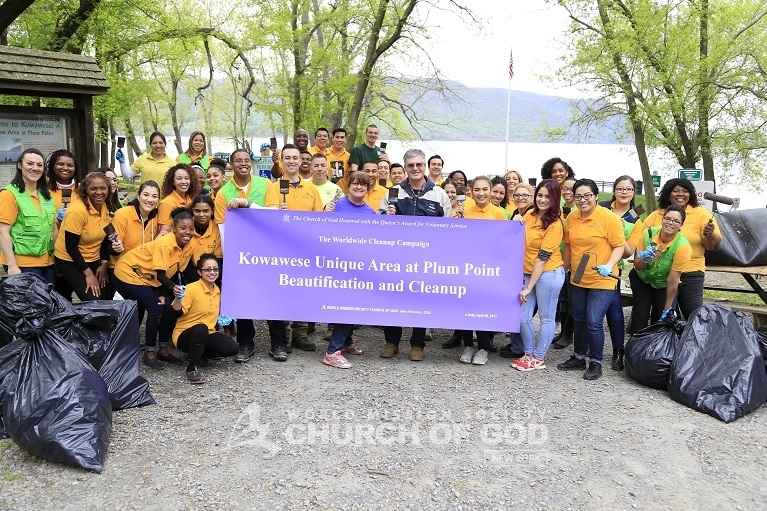 Group photo of Church of God volunteers with Legislator Christopher Eachus after beautifying Plum Point Park. Serving others is fun, especially when working unity. Every little deed performed with faith improves not only the lives of others, but also mine. I believe I now better understand the teachings of Christ regarding us being one global family united in love. When is the next event? I had a blast helping out at this cleanup. All of the volunteers were enthusiastic and ready to do whatever was needed to beautify the park. It was great to be involved in this. The volunteers of Church of God are so wonderful. They clean the park for the neighbors with love. 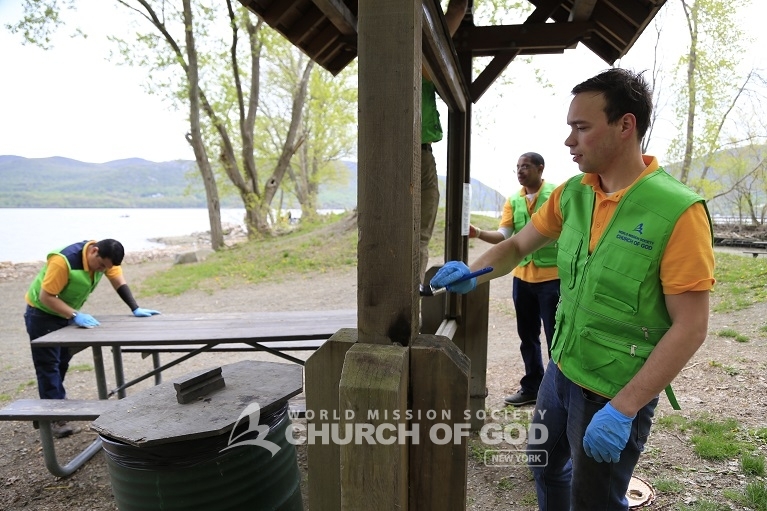 The World Mission Society Church of God is a Christian non-denominational church with more than 2.7 million registered members in more than 8,000 locations in 175 countries. The Church of God believes in Second Coming Christ Ahnsahnghong and God the Mother — based on the Bible. As the Bible is the standard for Christianity, the Church of God follows the teachings of God in the Bible, including the Sabbath day, the Passover and the feasts of God, the regulation of the women’s veil, and conducting baptism in the three names of God. Schedule a Bible study. 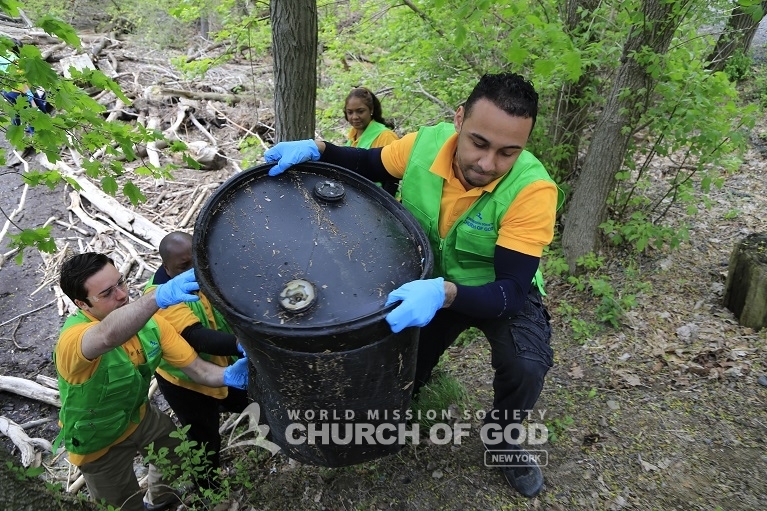 Church of God members put Christ’s teachings into practice by carrying out numerous volunteer activities. Focus areas include blood drives, environmental protection, disaster relief, blood drives, social welfare and smile campaigns. For its continued devotion to its communities, the Church of God has received numerous awards around the world. Volunteer with us.